I’m looking for some feedback on this idea! I created a new thumbnail for my game and here is a gif of some of the gameplay. The game is getting a positive response so far asides from the graphics being a bit plain. I’m glad I got 1 really big level made, there is roughly 5 mins of game play which is great for 48hrs! I got 3 variations of the enemies, 2 attack types, checkpoints, sound effects and my shape shifting mechanic is warping back in time. So you can create a decoy for yourself to give you time to kill the enenies. Step on the yellow portal, this will make you invulnerable and unable to attack for a few seconds. You will then return to the portal and a ghost will emulate the path you took during this shape shift. If your ghost is not visible to the enemy, the enemy will fire at you! Shape shift through time and create a decoy to fool the enemy. Throw daggers and dash with your dual wielding swords. I made this really cool game for a game jam about “bad box art”. This is my entry, cyborg lion. Today is the last day for rating the game so please give me some feedback. What engine or framework did you use for ludum dare 32? Which game engine or frame work do you preffer to use the most? It seems like unity is favored a lot and also surprisingly frameworks not listed. Some not listed are: construct 2, Phaser, Flashfunk, Playground.js, PlayCanvas, gamesalad, pygame, +more. Which game engine or framework did you use? Lets see which is the most popular game engine or framework for LD32. Just answer these 2 questions and I will post the results in a day or 2. The atmosphere was set really well with the music and dynamic sounds such as breathing and footsteps. The voxels turned out really well being hexagon shaped rather than the boring old cube shape and some times when I was play testing i completely forgot that this was voxel. This is gonna be a bit longer than the good. Even though the voxels looked nice I didn’t have enough time to vary the textures so most of the map is all one texture. The engine I set up for the voxels for this LD wasn’t finished. I still didn’t have an efficient way to place blocks. So I had to do all of that during the jam. That and the sound took up too much time, as a result the scares were pretty poor due to time. I rushed one type of scare and reused it. The first scare is probably the most effective but the problem is the player can easily be looking the other way and not understand why there is a screaming sound. The gameplay also was pretty bland, you will understand why if you play it, I don’t want to spoil it. Also some people end up dying near the end of the game because they got hurt too much in first scare and didn’t notice their hp dropping. I should have had a sound effect and an effect visually in the fps camera. I found a glitch late into development which I never got time to fix. Some of the doors would go out of control at times when they were open due to collision with a wall beside it. If the player got hit by the door it would either get time stuck in the ceiling or be shot though the roof and out of the map. Pretty funny at first until you figure out you have to start over. This glitch could have easily been avoided if I made a better way of placing the voxels and other objects. The theme of hexagonal voxel world should have stayed consistent throughout rather than having some smooth models and then some low poly ones. Finished my game and I’m pretty happy with my first attempt at a 3d game. Its a voxel horror game, i ran out of time near the end to do more and different types or scares. I think I spent too much time on the voxel part and it made it more complicated being hexagon voxels rather than cube voxels. When I was play testing it, I kept forgetting the game is even voxels because I spent so much time setting up the atmosphere of dynamic sound effect and music which are constantly changing, such as breathing and footsteps. The game turned out pretty creepy at the end but the scares are a bit too basic and not too effective, which is a result of them being rushed at the end. Working on some lighting and sound defects, to set a good eerie mood. Outside doesn’t look the best, I’m still working on the fog. It’s gonna be a dungeon horror game. Hopefully I can get randomly generation of the dungeon finished before the deadline. 20hrs in and I think I will do the 72hr ludum dare, I’m a bit more laid back about it this time. I have a rooms and walls generating from choosing 2 vectors and picking all the blocks needed from point a to b. which a and b are the opposite corners of the room. I think I will do a type of dungeon crawler game. 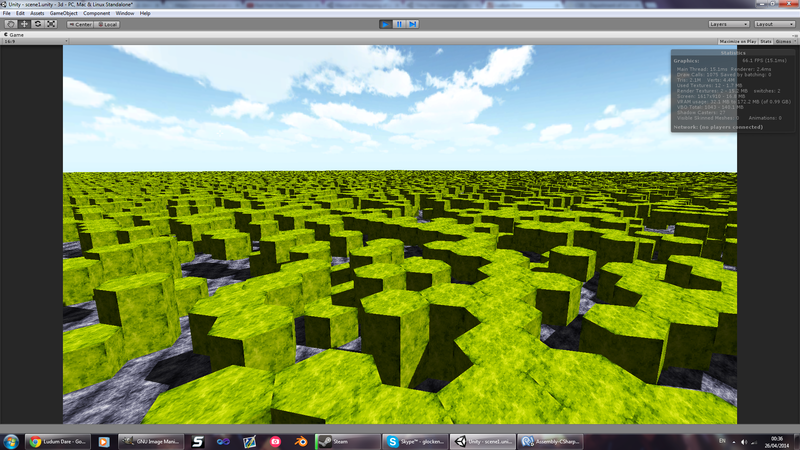 I can implement random generation and add some combat with some ai. All of the voxels shown are hexagons.